Climate scientists say we may have to get used to it. “This is the new normal,” said Thomas Pedersen, executive director of the Pacific Institute for Climate Solutions. Pedersen is part of the government’s Climate Leadership Team and will be advising the province on a plan to reduce greenhouse gas emissions. The public is invited to comment on B.C.’s Climate Action Plan until August 17th. Here are a four ways the province is experiencing the impacts of climate change right now. B.C. has 17,000 glaciers and they are all melting, according to Pederson. He says the implications of melting are profound because it means no late summer water supply, diminished hydro power production, and serious impacts on fisheries and spawning salmon. “This summer is a good example of what’s to come,” said Pedersen. Climate models indicate there will be more precipitation in the winter. However, more of it will fall as rain instead of snow, placing a greater importance on how fresh water is stored and managed. 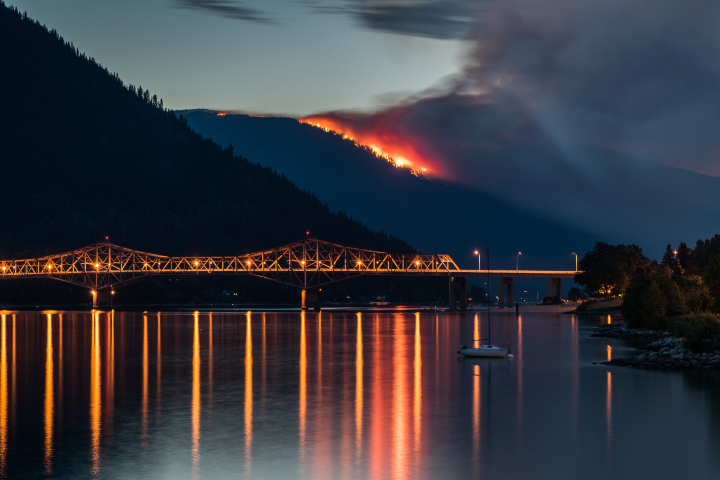 Wildfires started burning early in B.C. this year, and could continue burning longer than usual. “This year’s fire season is likely to go into the fall, from looking at the weather forecast,” said fire ecologist Robert Gray. Gray was part of an inquiry into devastating wildfires that destroyed more than 260,000 hectares of forest and more than 300 homes in Kelowna in 2003. He says the province could be doing a better job of preventing major wildfires by thinning out forests that have a lot of biomass and debris. He also says greenhouse gas emissions that are released during forest fires are another major concern. Farmers across B.C. say it has been a growing season full of surprises. “I just don’t know what normal is,” said Greg Norton, who owns a cherry orchard near Oliver in the Okanagan and has been growing food for 27 years. Norton is a member of the BC Agriculture & Food Climate Action Initiative, developed in 2008 by the BC Agriculture Council to help farmers adapt to the impacts of climate change. One of the main concerns is water shortages. Ranchers in the interior are concerned about dugouts drying out and increased drought and wildfires. In the Fraser Valley, berry farmers are contending with an earlier growing season and increased competition from foreign markets. Norton says he started noticing Chinese cherries in B.C. for the first time last year. Farmers are also concerned about extreme weather events and high tides crashing over dikes and ruining their soil with salt water. Scorching temperatures forced the poultry industry to bring in extra ventilation fans for birds this year, and Norton says the heat has caused an explosion of pests. In Peace River Country, however, he says farmers have had a good two years because of extra rain. The B.C. coast has seen record warm ocean temperatures of up to three degrees higher than normal, and it is already affecting marine life. “Fish move with the cool water or they perish,” said Rashid Sumalia, a bio economist at the University of British Columbia and author of a recent Vancity report that found sockeye salmon could decline by as much as 21 per cent by 2050. His biggest concern is that fish species migrating north in search of cooler temperatures are heading towards more acidic water. “One of the scientific findings is that our part of the ocean is a hot spot for ocean acidification,” said Sumalia. He said this is partly due to the dynamics in the Arctic, where fresh water glaciers are melting into the ocean. Posted on August 3, 2015, in Apocalypse Now and tagged climate change, forest fires, global warming, ocean warming. Bookmark the permalink. 5 Comments. the photo is Nelson, B.C. fyi.